There is the long-standing claim of the DAMA/LIBRA collaboration about a detection of dark matter via the highly significant observation of an annually modulating signal in radiopure sodium iodide crystals. 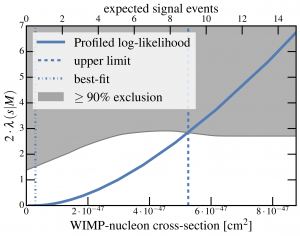 This signal, however, is in conflict with exclusion limits from various other dark matter experiments, including XENON100. Several alternatives to the classical WIMP scenario have thus been proposed in order to reconcile these null results with DAMA/LIBRA. One of these models is magnetic inelastic dark matter (MiDM). 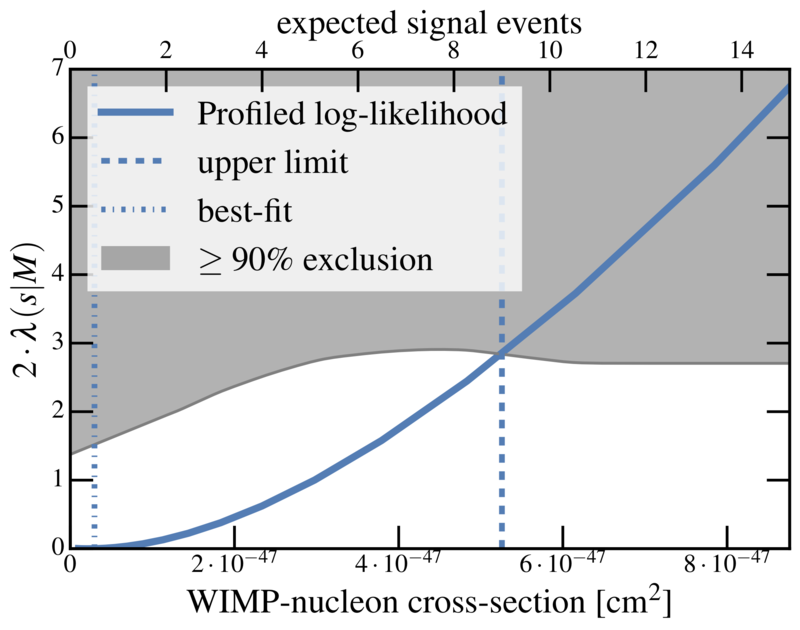 The MiDM model is motivated by comparing certain properties of the different detector targets and how they possibly influence the expected event rates. Iodine, used in DAMA/LIBRA, is distinguished by its high atomic mass and high nuclear magnetic moment. This enhances the signal of MiDM compared to other targets, such as xenon, and opens up new parameter space for the DAMA/LIBRA signal that is not in conflict with other null results. 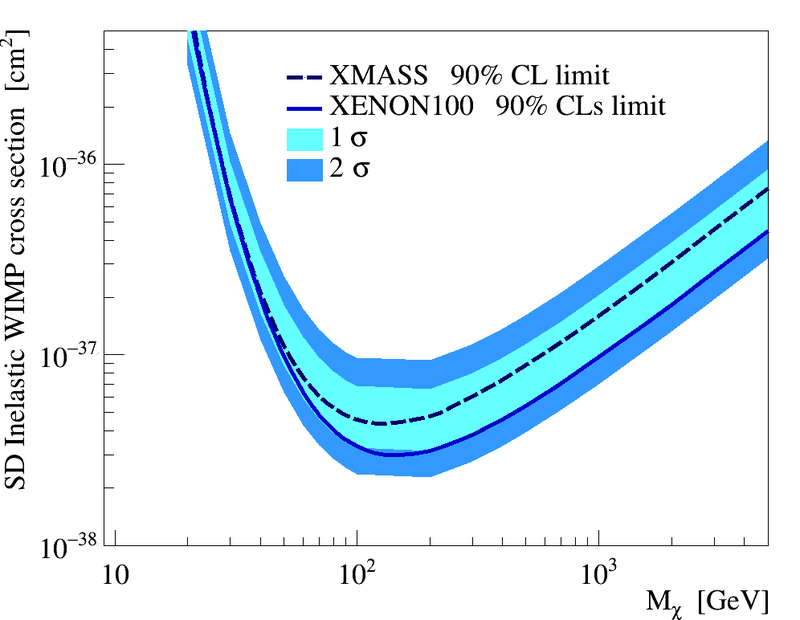 The exclusion limit (at 90% confidence level, CL) on MiDM interactions from of XENON100 for a dark matter mass of m=123GeV/c2. Also shown are the 68% and 95% (green) CL regions of the MiDM best fit to the DAMA/LIBRA modulation signal. The limit from COUPP data is shown as well. 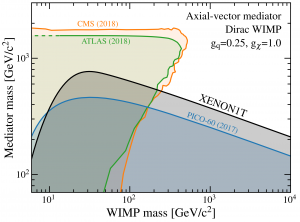 In the framework of MiDM the dark matter particle is expected to scatter inelastically off the nucleus, thereby gets excited, and de-excites after a lifetime of the order of order μs with the emission of a photon with an energy of δ~100 keV. Given the mean velocity of the dark matter particle, it travels a distance of O(m) before it de-excites. 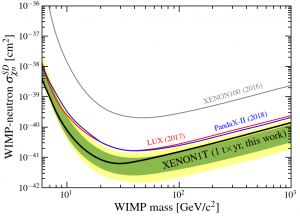 Furthermore it is assumed that the dark matter particle has a non-zero magnetic moment, μχ. 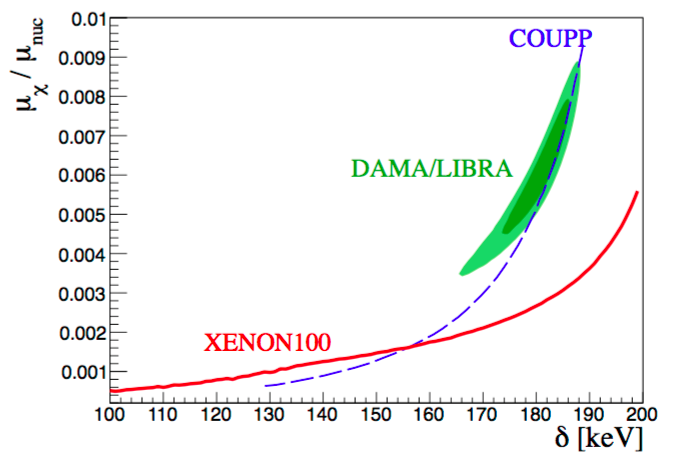 The combination of a low-energy nuclear recoil followed by an electronic recoil from the de-excitation creates a unique delayed coincidence signature which has been searched for the first time using the XENON100 science run II dataset with a total exposure of 10.8 ton × days. No MiDM candidate event has been found, thus we calculate an upper limit on the interaction strength. 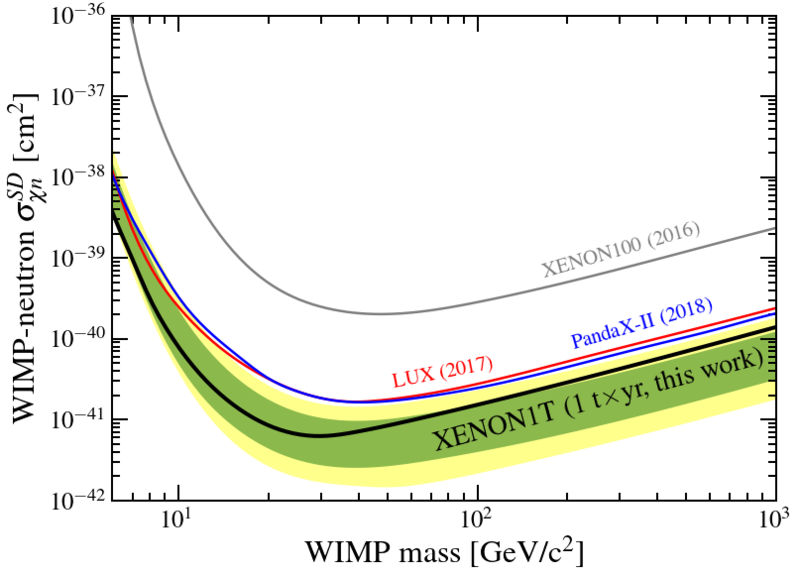 The Figure shows the resulting limit for a dark matter mass of 123 GeV/c2 which completely excludes the DAMA/LIBRA modulation signal as being due to MiDM.The sensitivity of this type of analysis will be greatly improved for current ton-scale (e.g., XENON1T) and future multi-ton dual-phase LXe TPCs (e.g., XENONnT, LZ and DARWIN). This is not only due to the increased target mass, but also thanks to the higher probability of detecting the de-excitation inside the larger active volume. 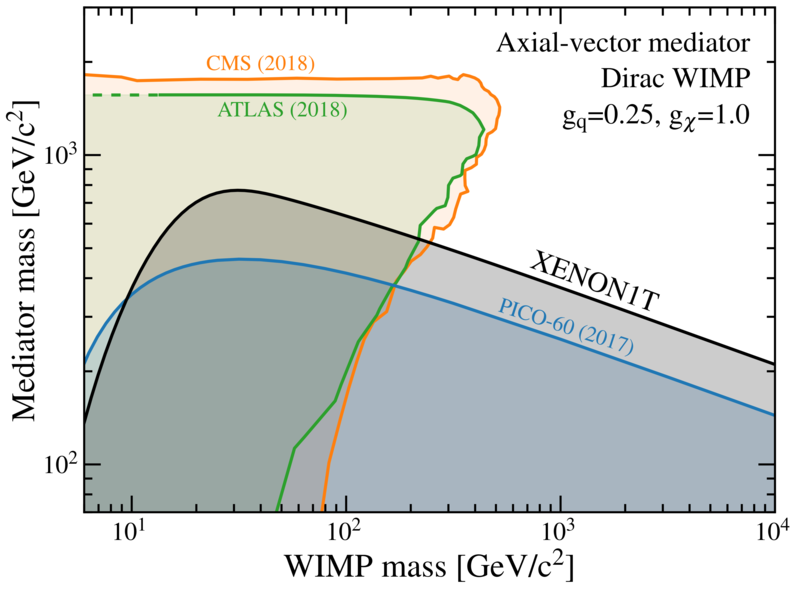 This entry was posted in Publications and tagged 2017, dark matter, magnetic inelastic dark matter, publications, results, XENON100 on April 24, 2017 by Lukas Bütikofer. would suggest that neutrinos are the signal to search for, as they are a direct product of the decay with a total energy of 2.8MeV, their weak interaction cross-section makes them not detectable. But there are two electrons now missing from the atom’s shell, which is usually from the closest one (K-shell). So there are two “holes” left at an energetically favored position. In a cascade-like process, electrons from upper shells are now dropping down, filling these holes. This releases their former higher binding energy of a characteristic value in the form of secondary particles such as X-rays or Auger electrons. These particles cascade is releasing a summed energy of 64 keV, which is the signature we expect to see with our detector. 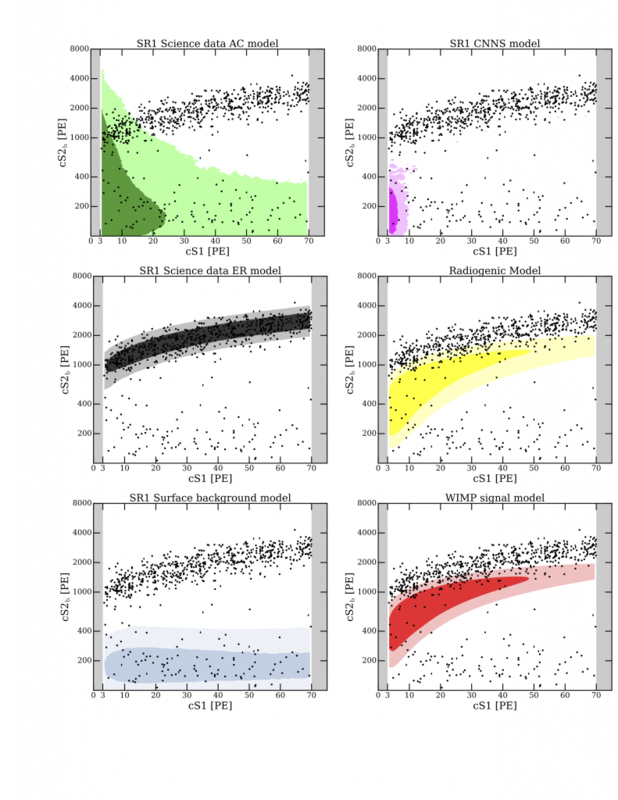 Looking for this signal in our well-known XENON100 data from 2011 to 2012 with 225 live days of exposure, we found no signal excess above our background. This way, a lower limit on the half-life of the decay with a value of 6.5×1020 years could be determined using a Bayesian analysis approach. 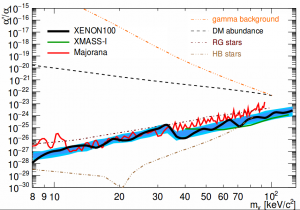 This is close to the optimistic theoretical predictions, but a bit less sensitive than the XMASS detector, which estimated the half-life to be larger than 4.7 x 1021 years. 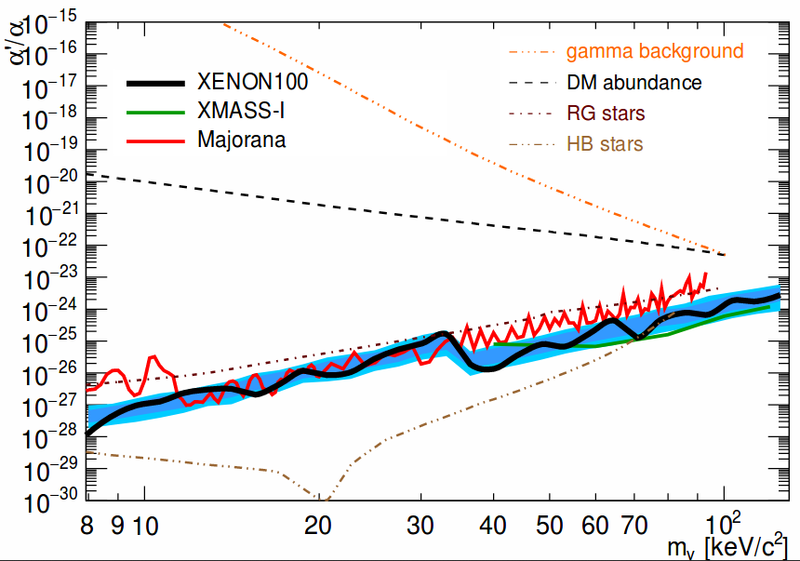 However, the results from XENON100 can be seen as the preparation for the next step, XENON1T. 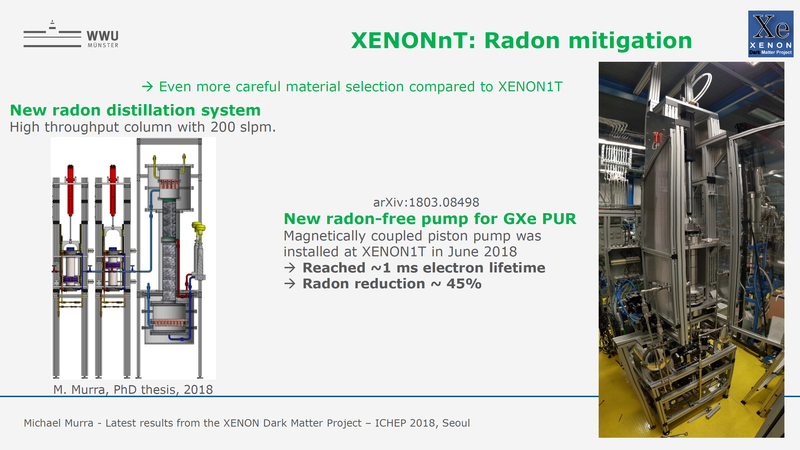 As XENON1T has about 2kg of 124Xe in its two-ton active xenon target (a factor of 70 more compared to the 29g used in XENON100) it will be more sensitive to this rare decay. 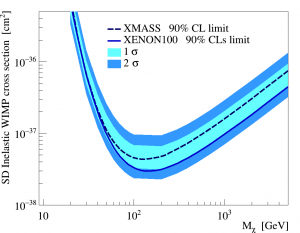 Moreover, the background in XENON1T is a factor of 30 smaller in the region of interest. 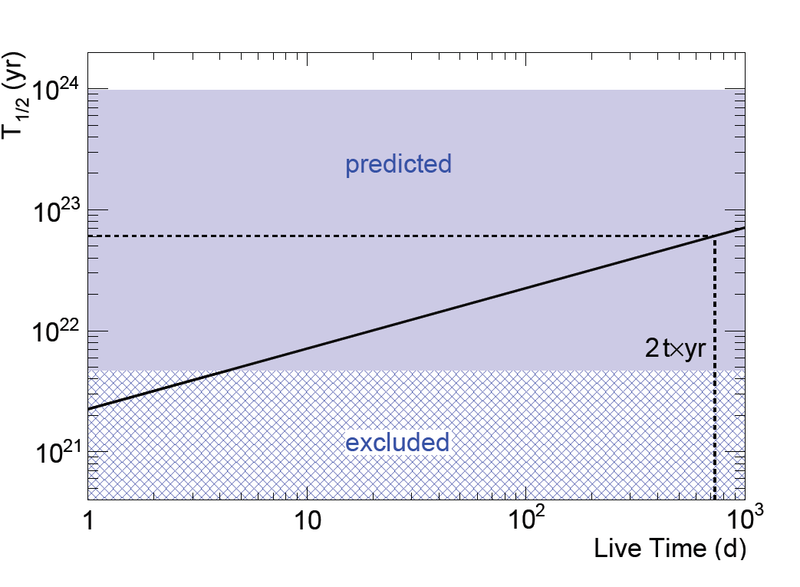 After only five live days of measurement it is thus expected to explore regions no experiment has explored before, and after 2 live years of measurement, we can probe half lives up to 6 x 1022 years (see Fig.1). 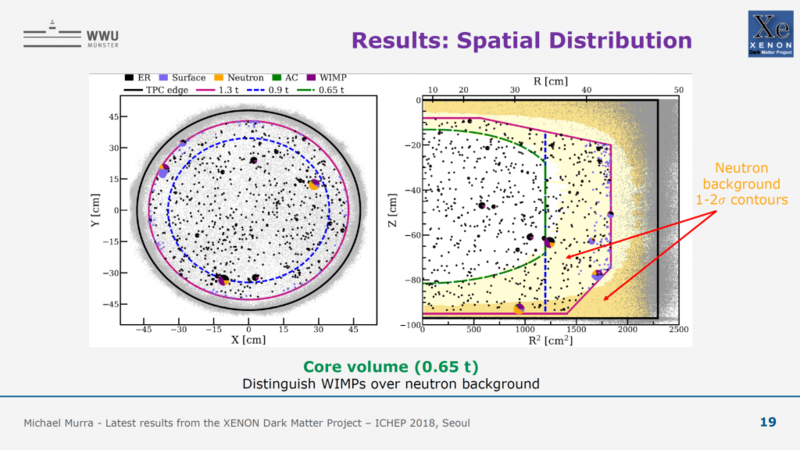 It has to be emphasized that this data comes for free while searching for dark matter particles, since both searches require the same settings. days new parameter space is explored. 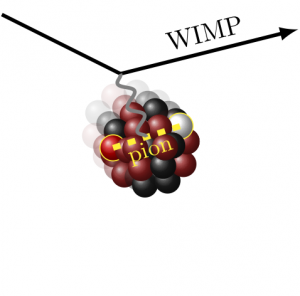 The XENON1T detector is also prepared to search for competing decay modes of the double electron capture, as it has an improved response to high energy signals. The so far unobserved emission of two positrons and two neutrinos as well as a mixture with one positron emitted and one electron captured simultaneously. While any detection of these decay modes would certainly lead to a deeper understanding of standard nuclear physics another possible decay branch could open the door to physics beyond the Standard Model: The neutrinoless double beta decay. If this hypothetical mode, where no neutrinos would be emitted, would be detected, it would reveal that they are their own anti-particles and annihilate in this process of double beta decay. This would prove the violation of lepton number conservation and, additionally, it could tell something about the mass of neutrinos, which is known to be very small (<eV) but is not determined today. 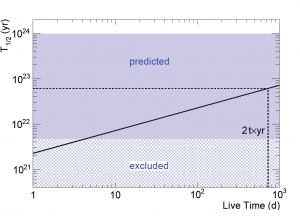 Unfortunately, the expected life time of these decays given by theoretical calculations is even larger than for the process with the emission of two neutrinos. This entry was posted in Experiment, Publications and tagged 2016, Double Electron Capture, publications, Xe-124, XENON100, XENON1T on February 27, 2017 by Alex Fieguth.